Rabri Devi and Tejashwi Yadav. 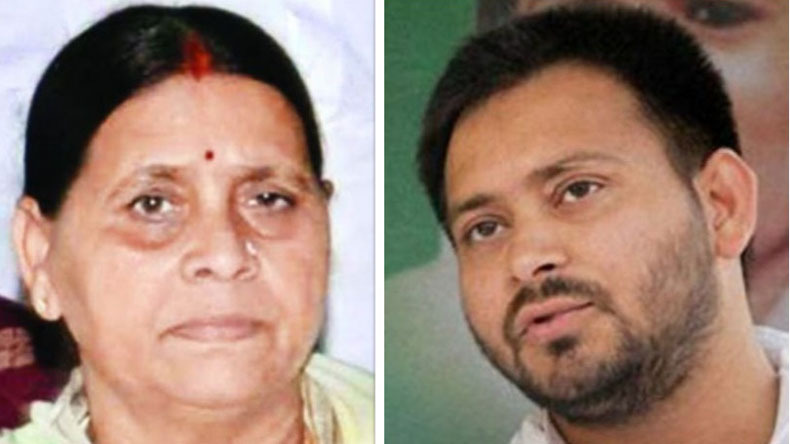 Delhi’s Patiala House Court on Friday granted bail to former Bihar chief minister Rabri Devi and her son and RJD leader Tejashwi Yadav in a money laundering case related to the 2006 IRCTC hotels maintenance contract scam. The same court has also issued a production warrant against RJD president and fodder scam convict Lalu Prasad Yadav for October 6, 2018. CBI has asked for issuance of a production warrant against Lalu Prasad as he didn’t appear before Patiala House Court today as he is in judicial custody in Ranchi. On Thursday, Lalu Prasad (Rabri Devi’s husband) surrendered before a CBI court in Ranchi, Jharkhand upon expiry of his provisional bail. Both, Rabri and Tejashwi got bail after furnishing a personal bond and surety amount of Rs 1 lakh each. The duo were named in the charge sheet filed in the case by the Enforcement Directorate (ED) earlier this week. With Lalu Prasad being convicted in 3 fodder scam cases. His political heir, Tejashwi Yadav is leading the party, now had he not been granted bail then the party’s chance to make a comeback into mainstream politics would have been dimmed, with party’s image taking a toll. Lok Sabha elections 2019: Congress to field Priyanka Gandhi Vadra against PM Narendra Modi from Varanasi?